There are two indisputable facts about housing in California: one, it’s suffering from a shortage of affordable housing — not just rental housing, but all forms of housing; and two, rent control has negatively contributed to this by not only hurting the production of affordable housing but constraining and diminishing the existing supply. Knowing this, I am stunned whenever I read editorials calling for the repeal of key protections, like the Costa-Hawkins Rental Housing Act, as a way of addressing the state’s housing affordability needs. Not only will its repeal do nothing for affordability, but it will devastate the state’s housing market for decades to come. By way of background, Costa-Hawkins was enacted in 1995 in reaction to the damage that rent control policies of the 70’s and early 80’s brought to rental housing production. Specifically, Costa-Hawkins sought to limit California municipalities’ ability to adopt rent control measures by exempting single-family homes and new multifamily construction of units built after 1995 from any form of rent control. It also allowed for “vacancy decontrol” by allowing property owners to reset rent of previously controlled units for new residents. These provisions were key to incentivizing new construction and allowing properties the opportunity to recover costs denied to them when the unit was rent restricted — two well documented negative effects of rent control schemes that undermined the goal of affordable housing. Another slightly less known, but equally important protection for the industry, known as the Ellis Act, is also under attack. Again, born out of the devastating effects of rent control, this act allows property owners to get out of the rental housing business. Prior to the Ellis Act, rent control regulations were written in such a way that it made it impossible for a property owner to evict a resident in the event that they needed to recover their property for either personal use or sale; thereby tying the hands of the property owner by forcing the property to remain a rental unit. With history as a guide, our elected leaders should learn from the past and create an environment that incentivizes supply, not mandate ill-fated regulations that have been proven to fail time and again. In general, California businesses have been dealing with the negative impacts of new taxes and rising employer costs — the cumulative effects of which discourage new investment and growth. So much so that many companies are looking out-of-state to escape burdensome regulations, labor costs and lack affordable housing that plagues their workers and directly impacts their ability to remain competitive. For the housing industry, taxes, cost and ever-increasing regulations all conspire to raise the price of housing, placing it outside the reach of many. The economic principle remains: if affordable housing is your goal, then the only way to accomplish this is through increasing supply. We need more housing in California, not more regulations. Repealing important protections like Costa-Hawkins or the Ellis Act will not help housing affordability. To the contrary, it will signal to the development industry that California is not a place where you should be investing in housing. A move that, if implemented, will have far-reaching repercussions for the industry and, most importantly, residents. Now is the time to join the fight: rental housing providers, realtors, developers and every other business that relies on a functioning real estate market must come together to fight what will become the most direct attack on our industry that we will ever see. Renters Rights activists are planning to spend millions of dollars on two key efforts to repeal Costa-Hawkins: the ballot box and state legislature. Simultaneously, the efforts to institute rent control directly at the local level remains a constant threat. To combat this, we must remain diligent by continually building consensus and coalitions. 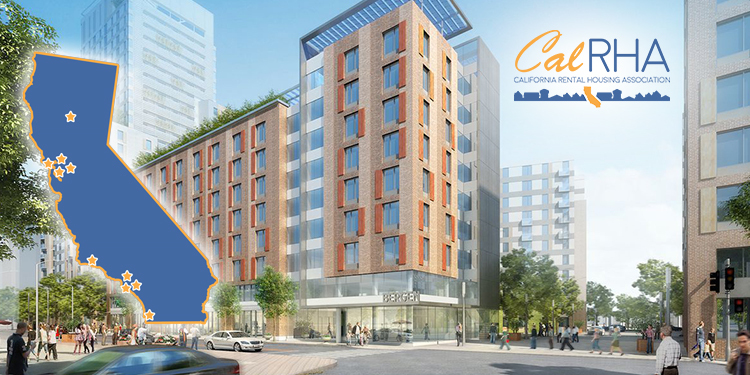 Being a member of your local apartment association and CalRHA is a terrific start. But it is increasingly important to be involved in your community. Join your local chamber of commerce or other business or charitable organizations to educate your community and colleagues of other industries of the importance of housing. It is up to us to explain how the lack of affordable housing impacts their access to the talent pool needed to compete and succeed in tomorrow’s ever-changing business environment. To aide in this effort, point them to the WeAreApartments.org website that details California’s 6.6 million apartment residents that contribute $139.1 billion to the economy annually and supports 1.3 million jobs. Further, point them to the area that shows that the demand for apartments is on the rise. Whether it is young professionals, couples, families or empty nesters, California will need to add 664,000 new apartment households by 2030, just to keep up with demand. Any opportunity you have to speak to your elected representatives must be leveraged. Tell them that rent control does not help affordable housing – it hurts affordable housing. Tell them that repealing things like Costa-Hawkins and Ellis Act will not lower the price of housing. Finally, appeal to what they intuitively already know: that increasing supply is the ultimate answer to addressing any shortage – it is where we, as an industry that operates in their community, can help them and their constituents the most. Written by Larry Cannizzaro, President of CalRHA | December 28, 2017 | © 2017 California Rental Housing Association. All Rights Reserved.